The tantalising question is—who made it? Brockwitz seems most likely, but which other makers are possible? Only known in marigold Carnival in the form of a delightful 6" cylinder vase, the first Carnival example of this rare item was reported by John & Frances Hodgson, who gave it the name “George”. The moulded pattern on this vase features eleven horizontal rows of small (slightly concave) squares, standing proud from the surface. The squares form a sort of waffle-block design. There are twelve vertical rows of squares around the vase and the base has a six point, petal-like star. John Hodgson’s research has revealed that Brockwitz’ 1915 catalogue shows several shapes in what certainly appears to be this pattern. Teasingly and somewhat frustratingly, however, the vase shape is not illustrated. Just to confuse and tantalise further, there are also some shapes in a similar pattern in the Walther 1904 catalogue as well as one in an early Reich catalogue. As both of those makers produced Carnival (although Reich made only a very small amount) they can’t be totally ruled out as candidates. Based on the currently available evidence, however, we feel that John Hodgson’s “call” for Brockwitz is arguably the most likely. On the right are images from the August Walther catalogue of 1904. Walther showed items in a similar block pattern to George, and as Walther is known for making Carnival Glass, we can’t totally rule this factory out as the maker. Catalogue courtesy Dietrich Mauerhoff and Siegmar Geiselberger. Here are catalogue images (courtesy of Siegmar Geiselberger) from two makers who are not really known for making Carnival (although Reich did make a very small amount), Reich and Streit. The chance of George being from either of these makers is very slim indeed, but it’s interesting to see the pattern was certainly a popular one. 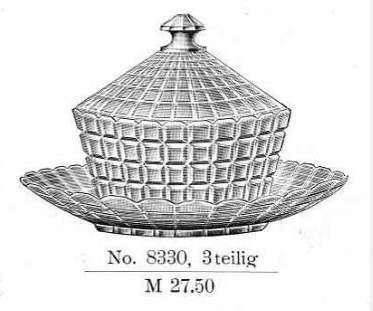 Far right - butter dish from a Reich catalogue dating between 1907 and 1925.
right - a biscuit barrel from a Streit catalogue of 1913.